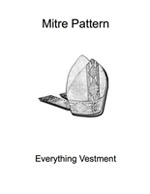 This Mitre Pattern provides you with a pattern and instructions to make a Liturgical Mitre. A Mitre is the traditional, ceremonial head-dress of bishops and abbots in both the Roman Catholic Church and the Anglican Church. It is also worn in Lutheran churches and Orthodox churches. It is typically either decorated with trim or embroidered. It gets its shape from very stiff fabric or stiff interfacing. Using this pattern, you can make a Mitre out of either silk or vestment fabric. You can find vestment fabric here. In addition to the Mitre Pattern, you will also need one yard of vestment fabric, one yard of satin and one yard of very stiff material or a heavy interfacing. You will also need two yards of religious trim for the Mitre and lappets. The tradition of wearing a mitre most probably comes from the headdress worn by the High Priest in ancient Israel which was called Mitznefet, a Hebrew word for mitre. The Mitznefet was a turban bearing a plate of solid gold with the inscription "Holiness to YHWH" or Holiness to God. In the Roman Catholic church, only bishops and abbots are permitted to wear the mitre. In the Church of England, bishops quit wearing the mitre after the Reformation. But during the 19th and 20th centuries the Oxford Movement - a movement of High Church Anglicans to restore Anglo-Catholicism - restored used of the mitre, and it is now worn by bishops on some occasions. Are you looking for a Cope Pattern? You can find a Cope Pattern here. Our Vestment Pattern provides you with the pattern and instructions to make a chasuble, stole, maniple, burse and veil. We offer our vestment pattern in regular and plus sizes. Learn more. Do you only need to make a chasuble? We have a chasuble pattern available in both regular and extra large size. Learn more here.